Our Mini Jute Bag GJ034 is the smallest bag in our stock range, it offers the perfect size to construct a Christmas gift set or to use as giveaways at a show. 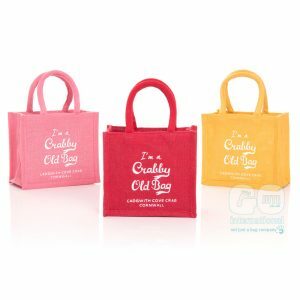 The small size makes it one of our most economical bags to add your branding to and with over 20 colours available you’re bound to find the perfect bag to make your brand pop. Are 20 colours not enough? Why not use our overseas production service and match your brand colours exactly to the bag by choosing a specific Pantone colour! Cadgwith Cove Crab used our mini jute bags to create these fun crabby bags. What better way to carry your fresh seafood home and get their name out on the high street!